Today we’re touring a family retreat by Hoedemaker Pfeiffer that offers a series of cabins. A main cabin provides the general gathering space and separate buildings, like a writer’s hut, create private little retreats within the family retreat. 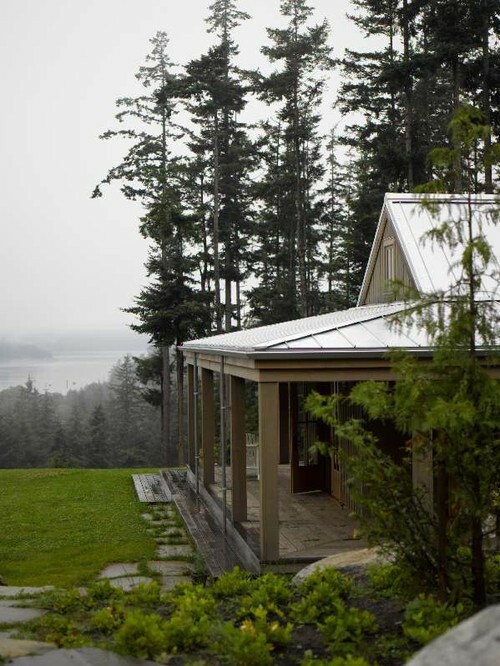 Today’s charming home is located on the San Juan Islands just north of Seattle. The main cabin enjoys an inspiring view from the front porch. Although the outside of the main cabin looks rustic, the inside is light and airy. 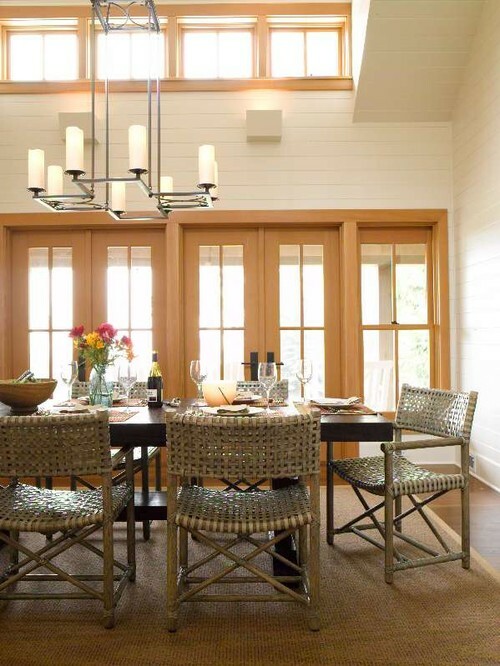 Transom windows allow natural light from French doors to flood the interior spaces. Trim work wears a warm mustard color and ample windows keep runs looking sunny despite the overabundance of cloudy days in the northwestern region. 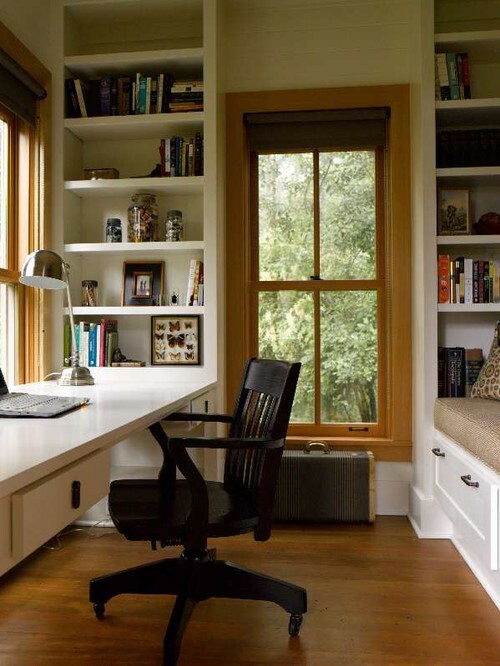 The writer’s hut embodies a cozy office area for working or simply getting a little me-time. 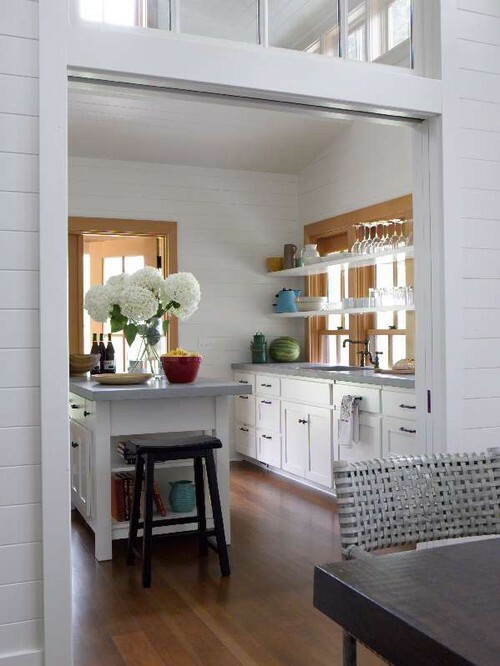 Rather than add upper cabinets in the kitchen, a row of open shelving resides in front of windows. Glassware is stored on the shelves and allows light to penetrate the room. 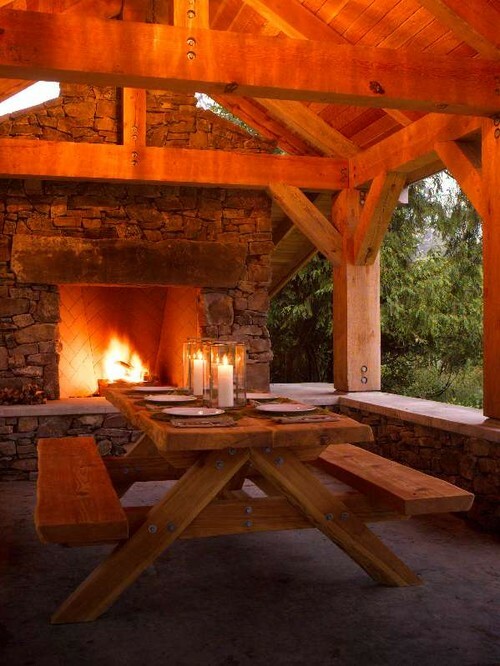 A family retreat wouldn’t be complete without a gorgeous stone fireplace and warming fire. The main bedroom enjoys vaulted ceilings and the same warm mustard color on the trim work. A beautiful claw foot tub is the focal point in the farmhouse style bathroom with shiplap walls and painted wood panel doors. 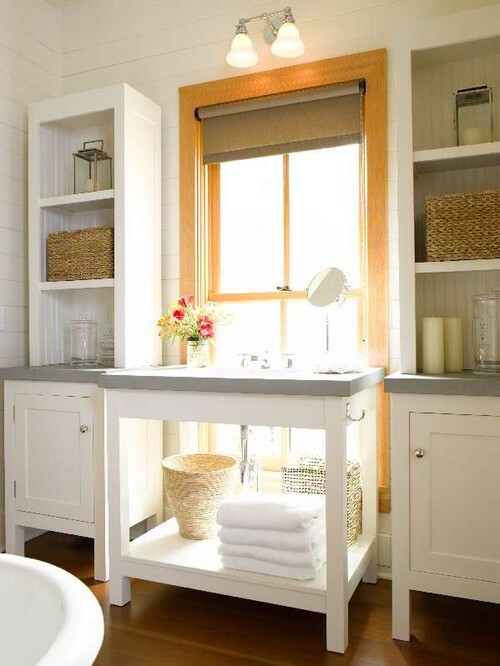 The sink is place in front of the window which creates storage space on either side. The family retreat has a common gathering space for outdoor meals and entertaining. 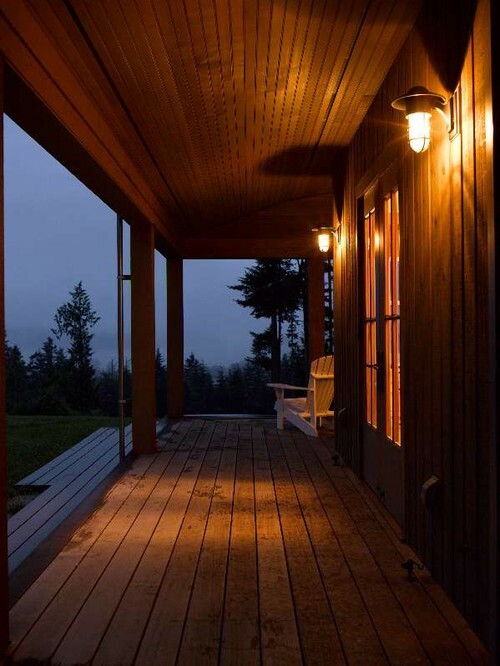 At night, the views from the front porch of the main cabin are just as beautiful as during daylight hours. 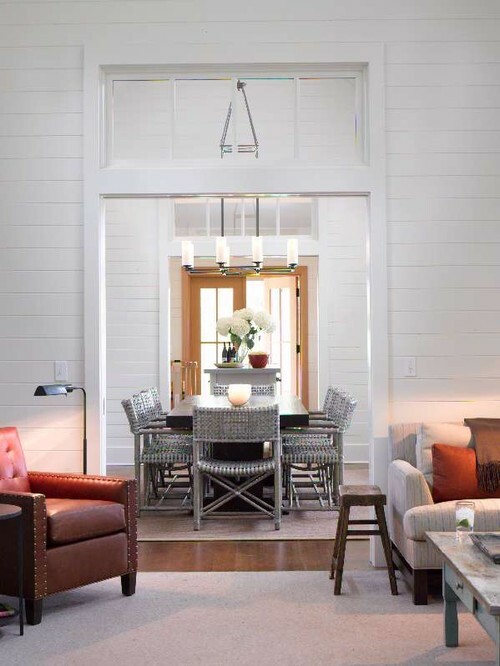 You can see more of this cozy family retreat over at Houzz. 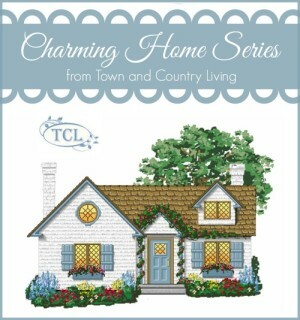 Enjoy more house tours in the Charming Home Series! That fireplace is special. So isn’t the rest of this retreat. Love all the built-ins. The simplicity of the design and furnishings are so appealing. Thanks for sharing this lovely property in a beautiful part of the country. 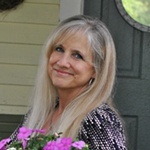 Jennifer I want you to know how much I appreciate your blog. Plus the fact that you reply to my comments via email is so nice. So few do that. Keep on sharing all your interesting ideas and house tours! It makes my day better. I don’t even know where to begin! The inglenook, maybe? Who would think to paint trim in mustard? This is perfection. Thank you for sharing. I love your blog! 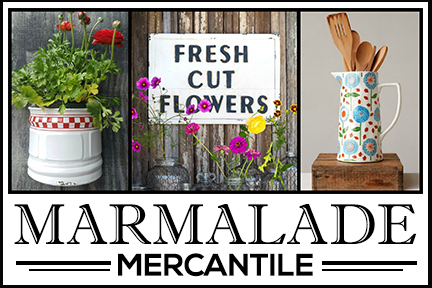 Plus the connection to my old stomping grounds (my daughter lives in St. Charles) make your blog one of my can’t miss, favorites! I so enjoy these home tours. Today’s home is just so warm and cozy. It’s just beautiful and such a great use of space too. This is a beautiful home….I can just imagine snuggling with my granddaughter on the bed beside the fireplace and reading her favourite Robert Munsch books!! Absolutely stunning!!!! Absolutely gorgeous! I could move right in!! 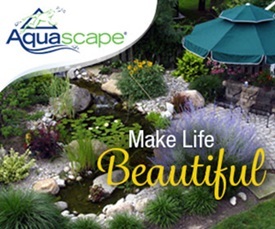 Thank you for sharing all of these beautiful homes. Oh my this is heaven on earth. 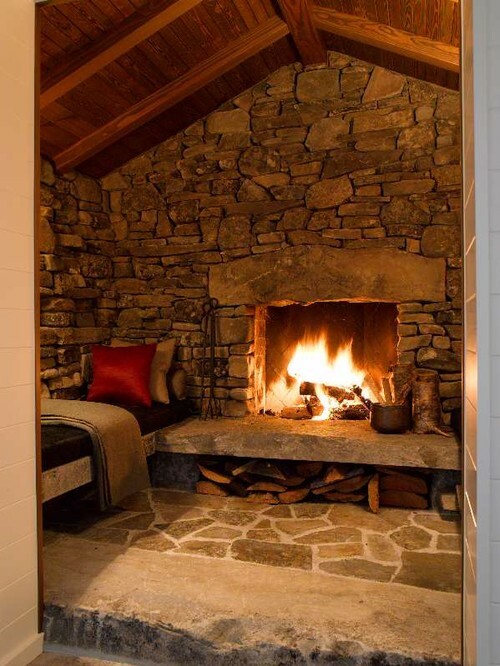 Love that bath tub and who to sleep in the bed next to the fire place. So cozy. Love this so much Jennifer. Cozy, warm and scenery to die for, what a perfect combination. I really liked those dining room chairs, thanks Jennifer. 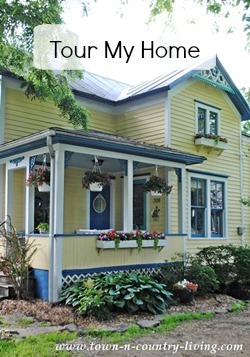 Maybe my favorite of all your home tours. Thanks for posting.